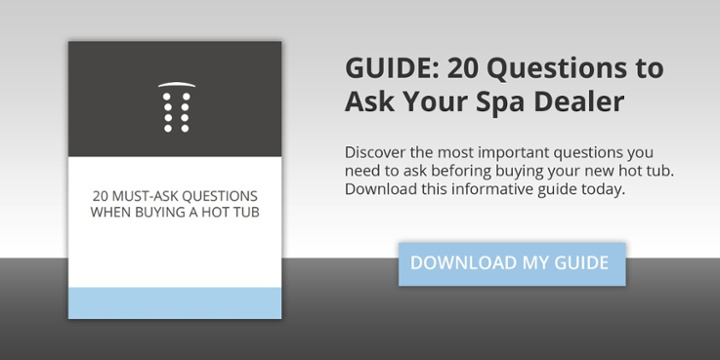 If you’re not planning on using your hot tub this winter (unthinkable, I know), you’ll want to winterize your hot tub. Winterizing prevents your hot tub from freezing overnight during low temperatures. To winterize a hot tub, turn off the power, drain all the water, clean the filters and shell, and secure the cover. If you plan on using your hot tub to warm up your winter nights, great! You don’t need to winterize a hot tub unless you plan on leaving your hot tub unattended for 6 weeks in a row or longer. This is typical if your hot tub is at a vacation home or cabin that you won’t be visiting frequently. The following supplies are necessary to properly winterize your spa. You should be able to find them all at your home improvement store or hot tub dealership. Shocking the spa water will slow bacteria, algae, and fungi growth in areas of your spa that aren’t completely free of water after you drain and winterize. We recommend super sanitizing your spa regularly, not only when winterizing your hot tub. This will make the water less cloudy, remove bacteria, and prevent odors in your spa. Shocking your spa with a non-chlorine shock can be done weekly if you frequently use your spa. A chlorine shock is best every quarter when you deep clean your hot tub. For safety reasons, make sure there is no power getting to the hot tub. Press the power button, unplug the power cord, and turn off the circuit breaker. Once you’ve turned the power off to your hot tub, drain and dry your hot tub completely. Failure to do so can cause water to freeze and create cracks in your hot tub which can be damaging to your plumbing and costly to repair. To drain your hot tub, pull the drain out of the spa and remove the drain cap. Attach a garden hose to the drain spout to activate the drain. Once the hot tub water is completely drained, pull the spout all the way out, remove the hose, replace the drain cap, and push the drain back into the spa. If you have a Bullfrog Spa with JetPaks, open all lower valves on the JetPaks to allow the water to drain from each JetPak as you drain the spa. Once the water is completely out of the spa, close each JetPak valve. Next, use a wet shop vacuum to vacuum the plumbing lines by placing the vacuum nozzle over each of the jet faces in the spa. It’s not a bad idea to do this twice, just to be safe. Finally, remove the drain plug from the pump, loosen all PVC pipe unions, and pump air-bleed valves in the equipment compartment. Replace the plugs on the heater pump. Do not replace the plugs on Pump 2. Tighten the unions or close the air-bleed valves until you de-winterize the spa in the Spring. Remove the filters from the spa and drain any water in the filter slot. We recommend cleaning your spa filters now and storing them in a clean, dry place until Spring. Pour 1 gallon of propylene glycol antifreeze into the filter hole to prevent the pipes from freezing. This is an added safety measure in case you were not able to empty all the water out of the spa. WARNING: Do not use ethylene glycol antifreeze (the kind used in cars), as it is toxic. Propylene glycol (the kind used in RV’s), is nontoxic and does not require evacuation at startup. Clean the inside of your hot tub by applying a small amount of window cleaner or dishwashing soap with a soft sponge or rag. Make sure to rinse well and dry completely with a clean towel. Clean and protect the outside of your cover with a weather-resistant cleaner such as 303 Aerospace protectant. This will help your spa cover keep its color and protect it from damaging UV rays and other weathering. 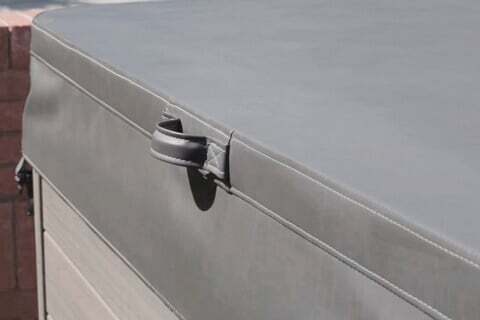 Make sure your spa cover is tightly secured to keep out rain or snow. If you live in an area with strong winter winds, consider purchasing some Hurricane Spa Cover Straps to keep your cover extra secure. If you live in an area where snow is frequent, place a large piece of plywood on top of the spa cover to help support the weight of the snow. Be sure to remove any snow off the cover after each snow storm. If you forget to winterize your spa and it ends up freezing, you’ll need to thaw all the ice and check for damage, leaks, and cracks. To do so, turn off the hot tub, carefully break through the ice, and remove as much of it as you can. You can pour hot water onto the ice to speed up the melting process. Once you have removed the ice, inspect the pipes, heater, and pumps for cracks or other damage. If you notice anything wrong, we recommend contacting your local authorized spa dealer for help. If you don’t find any damage, turn the spa back on and check for water leaks. Your hot tub should be fine if you don’t find any leaks, but we advise keeping a close eye on it for a few weeks to make sure there were no undiscovered issues. To enjoy your hot tub again in the Spring, clean any areas that have gotten dirty throughout the winter. And even though you used a non-toxic antifreeze, it still is a good idea to get it out of the pipes so it doesn’t irritate your skin. To clear antifreeze out of your plumbing, partially fill the hot tub with water, run the pumps for a few minutes, and then drain. Reconnect the pumps and heaters, open the air-bleed valves, and close the drain valves. Refer to your owner’s manual or call your spa dealer for any questions you might have. To finish de-winterizing your hot tub, simply replace the filters, refill the water, super sanitize it, turn the power back on, and jump in. I plan to leave for two months. The spa will not be maintained in that period. Is it best to winterize or simply get the chemicals at a normal level and turn down the heat? It’s our recommendation to winterize the spa if it will be left for longer than 6 weeks, especially if there will be freezing temperatures. You may also select to use a slow release sanitizer and simply lower the temperature, however, this isn’t ideal as it may increase the sanitizer beyond recommended levels or not have enough for the time period. To turn completely off you must turn the power off. If you are decreasing the temperature setting below the current set point and the spa continues to heat there is likely an error in the electronics. Contact your dealership for service. I need to put my tub on edge to move it through a gate. Does it matter which edge/side? No, it shouldn’t matter which side. Our power is out due to an ice storm. How long can my tub sit in 20-30 degree weather before I need to worry about anything freezing and causing damage. Tub was fully operational @ 102 degrees when the power went out about 36 hours ago. Let me double check with our tech team to be sure, but I believe it should be fine for 2-3 days. I’ll see if they have any tips for keeping it from freezing for longer in case the power doesn’t come back on for a while. I’ll get back to you with that info as soon as they respond. Robert, here is our tech team’s response: You will want to get a space heater in the equipment area or get a 100W work light to make sure that it won’t freeze. The heater pipe and pumps could freeze in a couple days. I would say if the power won’t be on in the next 5-10 hours I would put that in there.